I'm really beginning to think that some people often continue to have an unhealthy relationship with their body even after they start losing weight. For example, look at Biggest Loser winner, Rachel Frederickson. I know the big hoopla about her weight loss has been pushed to the back burner with bigger news stories such as lost planes and other stuff, but just give me a moment to bring her story back up. Rachel started on the show as a morbidly obese woman. You don't get that way overnight and most of the time you get to that point because of underlying issues (insecurity, depression, etc.). Rachel had those underlying issues and she had to deal with them in order to realize why she was treating her body in an unhealthy way. However, Rachel went from morbidly obese at 260 pounds to underweight according to the BMI scale at 105 pounds. In other words, she went from one extreme to another. She went from an unhealthy weight to an unhealthy weight. She just looks skinnier now. So, did she really change her relationship with herself and her body? I really do hope so, but I'm not sure. I know that some have said it's a competition and she did this to win..yada...yada...yada. But still, playing games with your health is not worth it. No matter where your starting point and goal line is, it's important to realize that your relationship with your body is the number one priority. STOP trying to beat your body into submission by using "get skinny quick" gimmicks. STOP looking at your body negatively. STOP thinking that you won't be happy or your life won't be complete until you are "skinny." START loving the person you are. START treating your body better with healthy foods and exercise. Do you treat your family and friends with disgust and impatience? 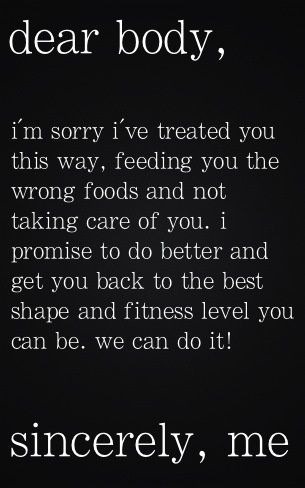 STOP treating your body that way. Maybe you've had an unhealthy relationship with your body for a long time. Just like any relationship, it's going to take time to heal. Give it time. Be patient. Learn from your mistakes and prepare for a healthier future.